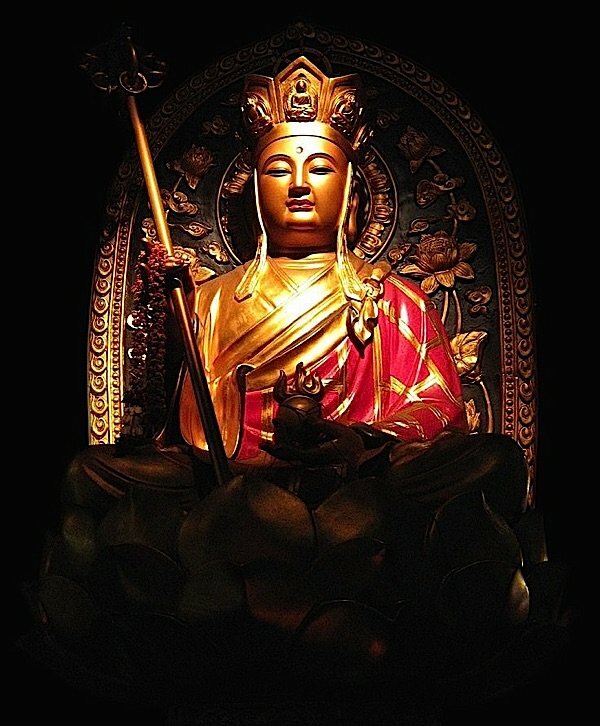 A modern image of Ksitigarbha. 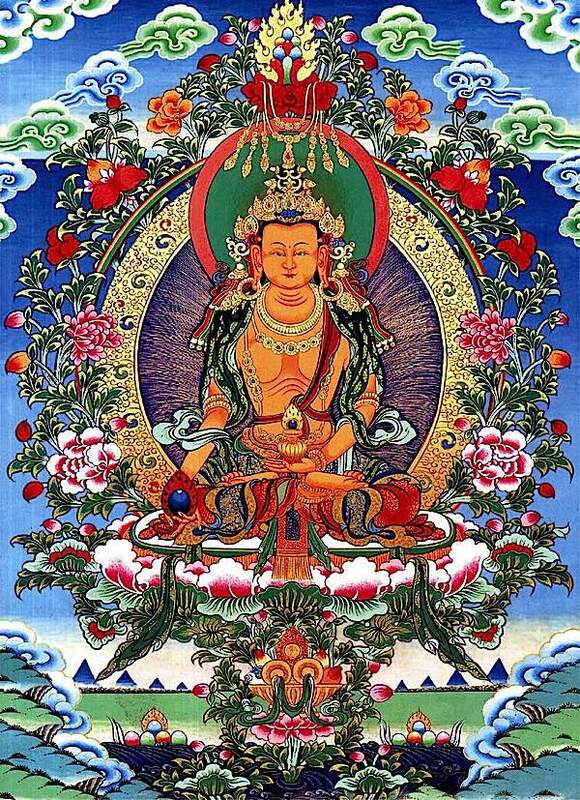 I prostrate, go for refuge, and make offerings to the bodhisattva Ksitigarbha who has unbearable compassion for me and all sentient beings who are suffering and whose minds are obscured, who has qualities like the sky and liberates sentient beings from all suffering and gives every happiness. Please grant blessings! 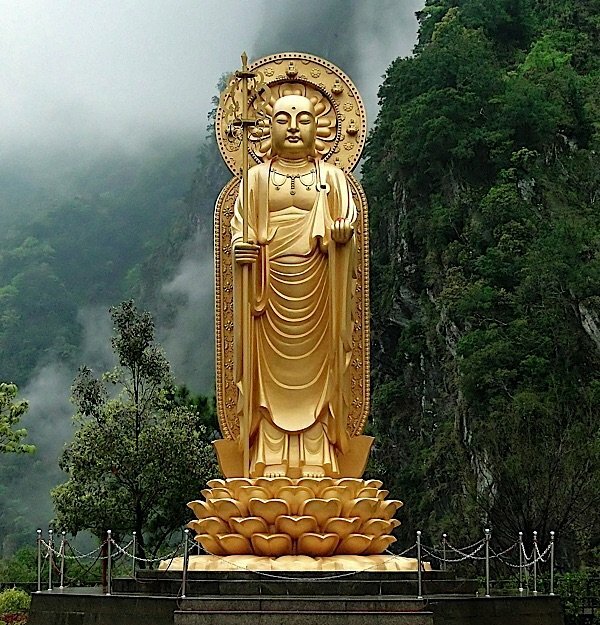 A giant statue of Ksitigarbha Earth Store Bodhisattva at Hsiang Te Temple in Taiwan. Photo: Bernard Gagnon. Lama Zopa explains the benefit of practice — beyond the relief during times of disaster: “This practice is especially beneficial for those who have heavy problems, serious health problems, big projects, or financial difficulties. I suggest it is extremely powerful to recite every day for protection, at least four or five times or more, depending on how crucial it is.” In Japan and China, he is also prayed to (as Jizo) when a loved one passes away. In sutra, he is known for rescuing people from hell. “You have generated stability of thought and the pure altruistic thought of bodhichitta and have eliminated the sufferings of immeasurable sentient beings. I see sentient beings receiving happiness as from a wish-granting jewel, and like the vajra you cut the nets of others’ doubts. You offer holy offerings to the foe destroyers, the qualified ones gone beyond, with great compassionate thought and perseverance. You liberate sentient beings from their sufferings with oceans of wisdom. Because you have no fear (delusions), you have gone beyond samsara. Kṣitigarbha is the only one of the four great Bodhisattvas portrayed as a monk, and not just a monk but a wandering mendicant with the great beggar’s staff. His face is kind and gentle and unperturbable, eyes half closed in contemplation though he is walking with his staff. 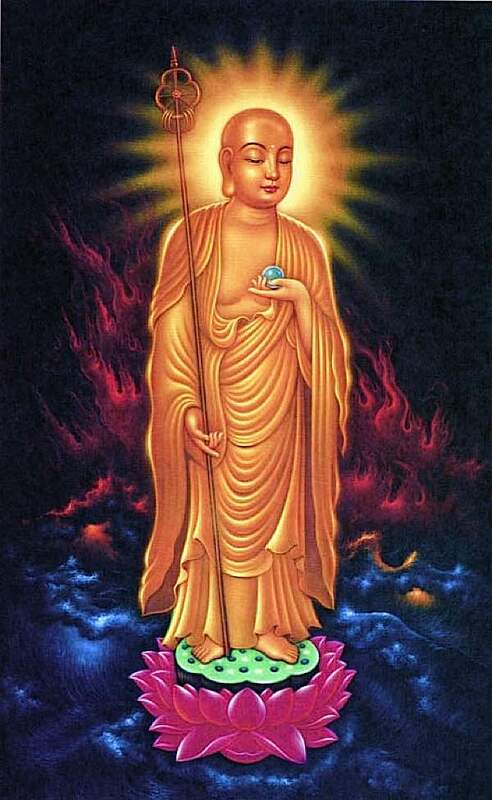 He is treasured and revered for his great vow to help all beings, including people trapped in hell. 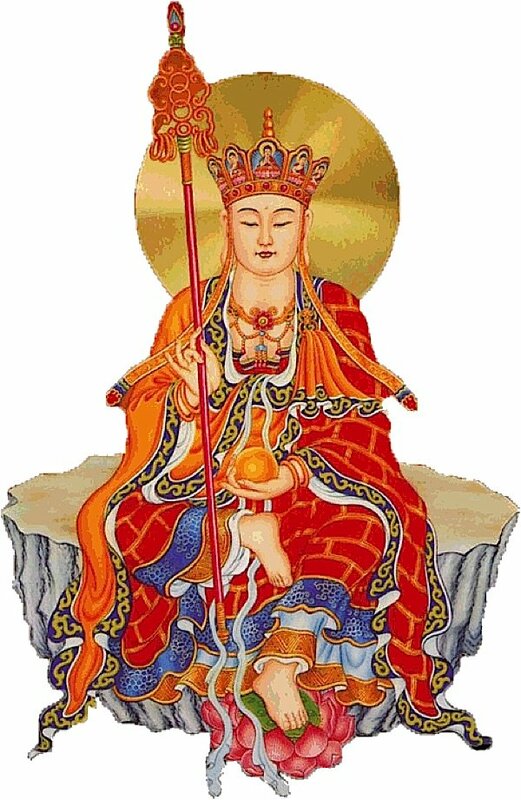 In his left hand, in statues and thangkas, he often holds a wish-fulfilling gem (wish-granting jewel), similar to Ratnasambhava, the Buddha of the South (earth). In his right hand he holds a towering “beggars” staff, that of a mendicant monk. In Tibetan thangkas, he is often depicted as a classical seated Bodhisattva with crown, but the majority of depictions are his monk aspect. However, even when regally adorned in his samboghakaya aspect, he still wears the robes of a monk. 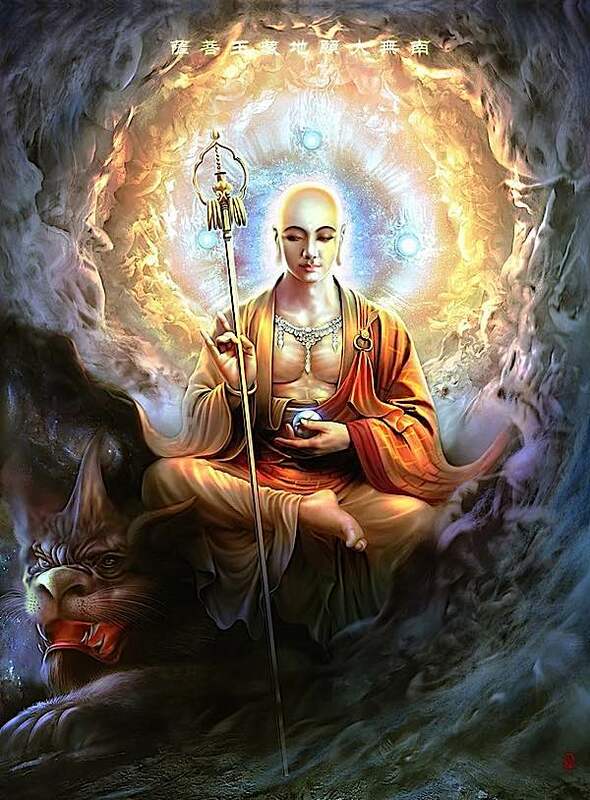 Ksitigarbha is depicted as a wanderer with staff — like Gandalf in the Lord of the Rings — to convey that he wanders the six realms, to help all beings. This aspect of Ksitigarbha is the “wanderer of the six realms.” Famously, he helps even beings in hell, not just on earth or other realms. “Reflect on how I have toiled for repeated aeons and endured acute suffering to take across and free stubborn beings who resist being taught and who continue to suffer for their offences. Find ways to liberate all beings in the Saha world from now until the time when Maitreya comes into the world. 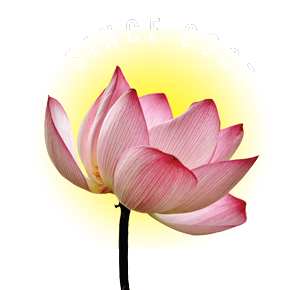 Help them escape suffering forever, encounter Buddhas, and receive predictions. At that time all the division bodies of Earth Store Bodhisattva that came from all those worlds merged into single form. 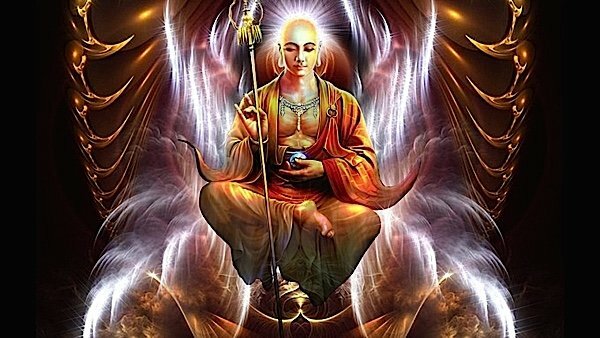 Then he wept and said to the Buddha, “Throughout long eons I have been receiving the Buddha’s guidance and from that have developed inconceivable spiritual power and great wisdom. My division bodies fill worlds as many as grains of sand in billions of Ganges Rivers. In each of those worlds, I transform myself into billions of bodies. Each body takes across billions of people, helping them to return respectfully to the Triple Jewel, escape birth and death forever, and reach the bliss of Nirvana. 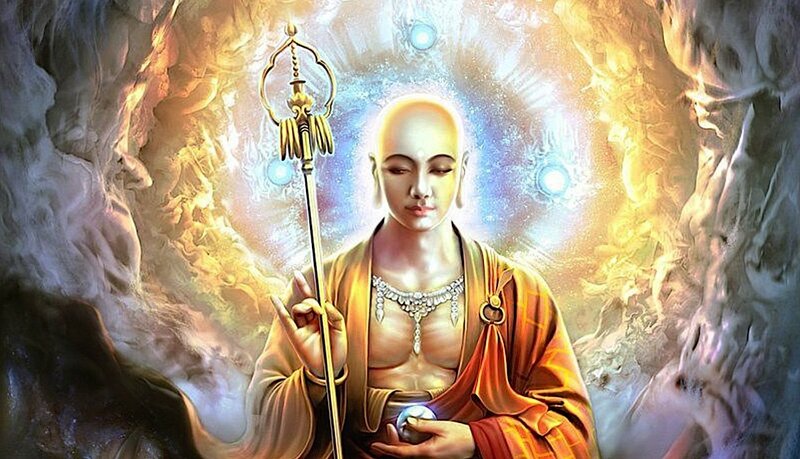 Even if their good deeds within the Buddhadharma amount to as little as a strand of hair, a drop of water, a grain of sand, or a mote of dust, I will gradually take them across, liberate them, and help them gain great benefit. Ksitigarbha in traditional Chinese form, as a monk. “Earth Store, Earth Store, remember this entrustment that I am again making here in the Trayastrimsha Heaven in this great assembly of hundreds of thousands of millions of indescribably many Buddhas, Bodhisattvas, gods, dragons, and the rest of the Eightfold Division. I again entrust to you the gods, people, and others who are still in the burning house and have not yet left the Triple World. “Do not allow those beings to fall into the evil destinies even for a single day and night, much less fall into the Fivefold Relentless Hell or the Avichi Hell, where they would have to pass through thousands of millions of eons with no chance of escape. “Earth Store, the beings of southern Jambudvipa have irresolute wills and natures. They habitually do many evil deeds. Even if they resolve to do good, they soon renounce that resolve. If they encounter evil conditions, they tend to become increasingly involved in them. For those reasons I reduplicate hundreds of thousands of millions of bodies to transform beings, take them across, and liberate them, all in accord with their own fundamental natures. You roll past the K with a soft “cu” sound (cu-shih). “It is good to recite daily the Sutra Prayer [after the mantra] praised by Buddha to Ksitigarbha and the Prayer that I have added [below]. 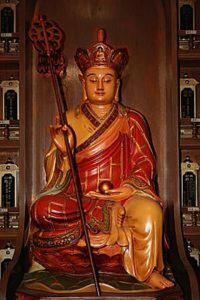 Sometimes you may recite the long praise to Ksitigarbha explained by Buddha [yet to be translated into English] along with the Prayer, if you can. With hands folded in prostration, you can visualize doing the prostrations to all the Buddhas and bodhisattvas; the saying of the word “prostration” becomes prostration. When you say the word “Refuge,” think that you are asking to be free from the two obscurations (to be able to achieve enlightenment). When you say the word “offering,” you think that all the offerings that you have are then offered. When you ask for blessings, you think in your mind that the whole path to enlightenment is the blessing to be received. You have generated stability of thought and pure thought [altruism/bodhicitta] and eliminated the sufferings of immeasurable sentient being. I see [sentient beings] receiving happiness like the wish-granting jewel, and like the vajra you cut the nets of doubt [of others]. You offer the Destroyer, Qualified-Gone-Beyond-Ones holy offerings with great compassionate thought and perseverances. You liberate the sentient beings from the sufferings with oceans of wisdom. Because you have no fear [delusions], you have gone beyond samsara. 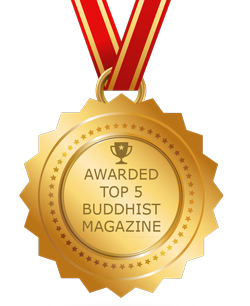 Josephine Nolan is an editor and contributing feature writer for several online publications, including EDI Weekly and Buddha Weekly. 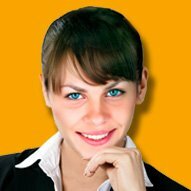 She is Editor-in-Chief for Blogertize Publications. Tantra Helps “Stop Ordinary Perception”, and is the Fast Path to Enlightenment. But How Do Modern Buddhists Relate to Deities?